When PowerPivot was announced a couple of years back, I was one among the many who started feeling insecure on having to learn a new trade. I could have sat there and kept on cribbing, or picked myself up and started my baby steps towards the new technology. As Hillary Clinton said, the challenges of change are always hard. It is important that we begin to unpack those challenges and realize that we each have a role that requires us to change and become more responsible for shaping our own future. I am glad that I gave PowerPivot a chance and kept on learning (it sure helps sitting next to a passionate PowerPivot supporter like Javier Guillen! ), else I wouldn’t have realized how much useful it is to me. Agreed that it has it’s fair sets of limitations, but as the community grows and the technology matures, we will see that many of it gets resolved or have workarounds. For eg, if you had asked me before on whether there was any way in PowerPivot to group all the row values into a single delimited row, I would have said no. But seeing this question in the PowerPivot forum, I decided to spend a little more time in the weekend and found a workaround, which I am sharing through this post. 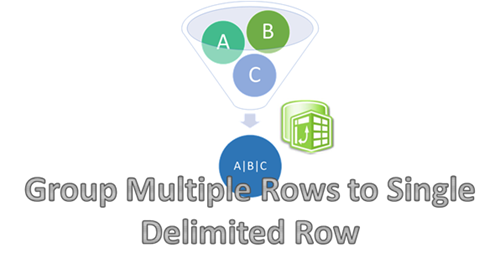 There is only one function (atleast as far as I know) in PowerPivot that returns a delimited list from multiple rows – PATH(). But the issue is that PATH() works only with a parent child hierarchy. So the trick for getting this piece done would be to build an artificial parent child hierarchy. Follow the steps below to get the solution:- 1) Make a calculated column called Rnk which will generate a running number of the states within a country. This will allow us to uniquely identify each state value within a country. This will allow us to get the parent node id of the parent child hierarchy. 3) Now, make a calculated column called ParState which will get the Parent State for the current row (based on the ParRnk column). 4) The final part of the solution is to make the delimited list column by using the path function where State is the child node and ParState is the parent node. But if we directly apply the PATH function in each row, we will not get the intended results as you can see in the image below. Wasn’t that a fascinating workaround? If you want to play around, you can download the excel file from here. 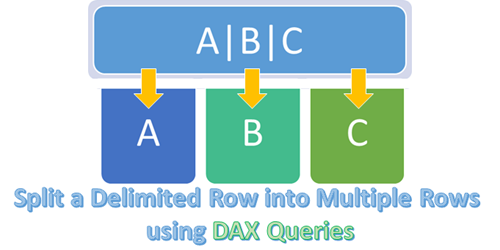 Last week, I was going through the PowerPivot forums as usual and was answering a question on How to handle count of data with “valid to/from” dates in DAX. This was a classic case of the “Events in Progress” or finding the number of active events between a start date and an end date (In case you haven’t read, Chris Webb (blog | twitter) has got some great posts on the Events in Progress solutions using both DAX and MDX). I replied back with a possible solution and soon, Marco Russo (blog | twitter) came up with a much more elegant solution. But more than the solution, what caught my eye was that our results were not matching and after a few email exchanges with Marco (and a big thanks to Marco for taking time off to answer my questions), we came up to the conclusion that it was because of the difference in our interpretations of the Event in Progress. That is when I thought of classifying the different interpretations of the “Events in Progress” as well as extending Marco’s solution for the same. To give an example, say we are analysing the events in progress for January 2012. For Scenario S2, this would mean the number of events which have a From Date (or start date) less than or equal to January 1 2012 (which is the minimum date for January 2012) and To Date (or end date) greater than or equal to 31 January 2012 (which is the maximum date for the January 2012). Here also, we can further sub-categorize whether the start and end dates are inclusive or exclusive but this is not done for the sake of simplicity and also because our solution can easily be modified by removing the equal to symbol. It might be easier to understand the relationship between the four scenarios with the help of a Venn Diagram. As you can see, Scenario S3 is the superset and includes any event that was active on any date in the selected time period. Scenario S1 requires that the event started before the time period but can end during any day on or after the time period. Conversely, scenario S4 requires that the event started on or before the time period and ends on any day after the time period. Scenario S2 is the intersection of the scenarios S1 and S4 and requires that the event starts before the time period and ends after the time period. 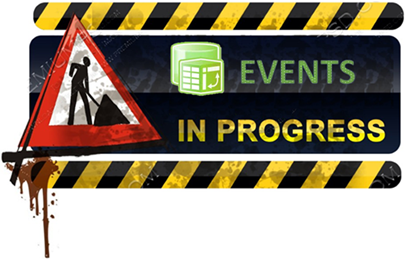 This means that those events starting or ending in the selected time period will not be counted. Let’s have a look at the four scenarios from a different visualization perspective. Now that you have got a good idea of the different scenarios, let us look at some sample data that we can use for testing the solution. Given below is a simple fact table which contains Order Numbers with a From Date and To Date and also the Order quantity. 3) Now let us have a look at the results to make sure everything is coming correctly. I have filtered for January 2012 and you can see that the dates in that table are showing the same values for all the five measures. Let us pick 10 January 2012 as an example. Only 11001, 11003 and 11004 suffice the conditions and hence the measures are all 3. The results come up correctly even if we look at a month or year level. If you want to try this on your own, feel free to download the completed excel file from here. Today is Black Friday here in the US and I don’t have time to write a regular post (as I am scourging for deals online and planning to get out for shopping as soon as the insane lines outside the stores dwindle in numbers). 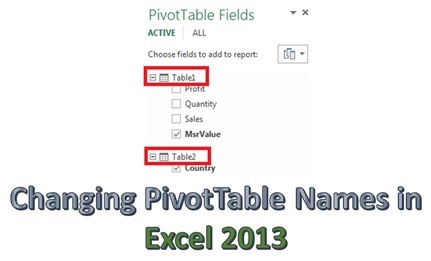 So this is just going to be a quick tip for those who have tried upgrading their PowerPivot models with linked tables from Excel 2010 to Excel 2013 and found out that their PivotTable names don’t match anymore. 1) For the purpose of this demo, let us use the PowerPivot file that I created in Excel 2010 for my last post – Measure Selection using Slicers in PowerPivot. You can download it from this link. If you open it in Excel 2010, you can see the original table names in the field list as well as the linked tables used to create the model above. 2) Now close the file and then re-open in Excel 2013. Julie Koesmarno (blog | twitter) has put a step by step post to upgrade this workbook from 2010 to 2013 here. Also have a look at this post – Upgrade PowerPivot Data Models to 2013 for any potential issues while upgrading your workbook. Now once you have done that, you will see that all the table names have changed in the field list. However, there is no change to the table names in the underlying PowerPivot data model. 4) You can see that the changes are reflected in the PivotTable field list now. You could avoid doing these steps in Excel 2013 if you had renamed your linked tables in Excel 2010 using the same way before upgrading. If not, it will just take the name of the linked table when you upgrade. Apparently, this is a known issue and will be fixed in the next release as per this thread. Of course this does mean that you lose the formatting. Now you can see that the slicers are working. This clearly is a bug as it works in Excel 2010 (as well as in the Professional Plus edition of Excel 2013). I have raised a Connect issue here, please vote for it so that it can be rectified in the next release. Ok, time to run for the Black Friday shopping now!